A lot of backup suites are available in Windows, but with about half hour of your time, this will provide you with a backup solution. Try the following just by filling the blanks in the scripts. I’ve found the following combination to work pretty well. This combination is a D2D, with the possibility of a D2D2T otherwise D2D + Previous versions (Windows 2003 and on-wards). So, let’s begin – the D2D backup – Robocopy. Worthwhile mentioning – The below recommendation has been tested in an environment containing about 2Tb of Office docs and other various bits. First use robocopy, the following script should be used by filling in the blanks – source, destination and whee you want your log file. I found this to take about 30 mins in a production environment. The log location is going to be pretty important in that we will be firing this puppy to your SMTP server! Ok so now you have replication between your source and destination. Great! Lets get some monitoring going. Ok – so now you are getting a D2D and are also receiving logs – Sleek! Now that this is going so well, we will probably want to some previous versions of your files using ShadowCopy. The limit to *how much* space you will want to allocate to your previous versions is highly dependent on the *type* of files you will want to recall – ie more space for large files such as videos. There is no right/wrong answer for this.. experiment and see what best fits the environment you are in – if you need to allocate more space to previous versions, so be it, if not, all the better. The following script will be an easy way to trigger a shadow copy and should be scheduled as a daily job as well. As far as shadow copy goes, I found the following allotment to work well on a 2Tb resulting in a 35 day retention period in an environment with little change – once again dependent to the amount of change in your environment. The screenshot is from Win 2008 R2, valid to 2012 and 2003 environments as well (given tiny gui changes). Free backup using Ms built-in functionality. 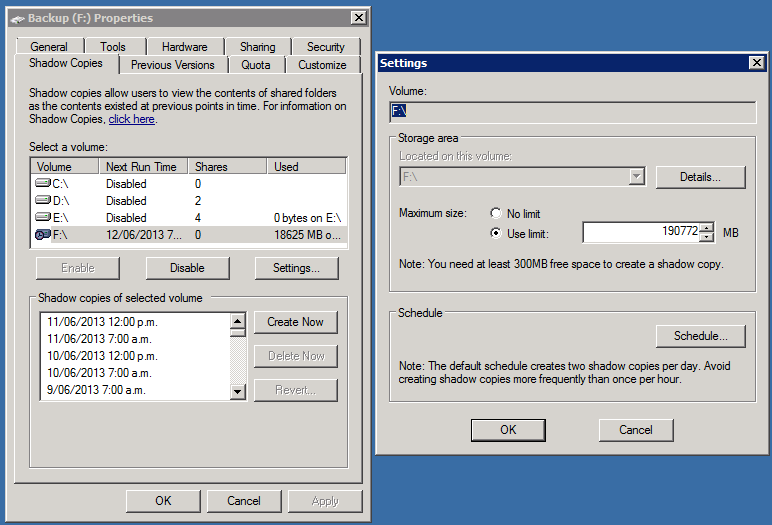 D2D Backups – free deduplication. Monitoring (to email) for this backup. This has server me well since 2003 days, never got the chance to document it. Worth mentioning that Windows 2008 onwards also support multi-threaded robocopy-ing! Best of luck for now – Go fourth and backup – maybe restore a little too!